The province is introducing amendments to strata property regulations in an effort to crack down on strata vacation rentals. Under the new regulations, which will come into effect Nov. 30, strata corporations will be able to fine owners or residents not complying with short-term rental bans up to $1,000 a day. Currently, stratas can pass bylaws banning short-term rentals, with a maximum fine of $200 per week. In B.C., ownership in condominiums, apartments or townhouses sharing common areas is often purchased through an owners’ corporation under a strata title. The owners elect a council that sets policy for the strata. The province said the amendment is in part to increase the rental vacancy rate, by discouraging hosts and owners from turning their properties into short-term rentals. “We’ve all heard the stories of renters losing their homes when units are pulled out of the rental market to be used as short-term rentals,” said Selina Robinson, Minister of Municipal Affairs and Housing. Angela Calla, Mortgage Expert, AMP of the Year in 2009 has been helping British Columbian families save money with the best mortgage strategy for over a decade from her Port Coquitlam office location. She is a regular contributor to national and regional media outlets and long-time host of The Mortgage Show on CKNW Saturdays at 7pm, and sits on many advisory boards for mortgage lenders and insures. Canada Mortgage and Housing Corp. is making changes intended to make it easier for the self-employed to qualify for a mortgage. The national housing agency says it’s giving lenders more guidance and flexibility to help self-employed borrowers. Self-employed Canadians may have a harder time qualifying for a mortgage as their incomes may vary or be less predictable. CMHC is providing examples of factors that can be used to support the lender’s decision to lend to borrowers who have been operating their business for less than 24 months, or in the same line of work for less than 24 months. It is also providing a broader range of documentation options to increase flexibility for satisfying income and employment requirements. The changes, which apply to both transactional and portfolio insurance, will take effect Oct. 1. CMHC chief commercial officer Romy Bowers said self-employed Canadians represent a significant part of the workforce. “These policy changes respond to that reality by making it easier for self-employed borrowers to obtain CMHC mortgage loan insurance and benefit from competitive interest rates,” Bowers said in a statement. Canada’s economy continues to operate close to full capacity. 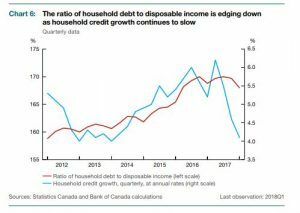 “Household spending is being dampened by higher interest rates and tighter mortgage lending guidelines.” The ratio of household debt to disposable income is edging down as household credit growth continues to slow (chart below). Consumer spending growth has been slowing since mid-2017, led by a pullback in interest-sensitive components such as vehicle purchases, furniture, appliances and dwelling maintenance. With the slowdown in housing purchases, housing-related spending has also slowed. The sensitivity of consumption and housing to interest rates is estimated to be larger than in past cycles, given the elevated ratio of household debt to disposable income. The impact of higher interest rates likely differs across categories of borrowers, with highly indebted households the most affected. The Bank said that “Recent data suggest housing markets are beginning to stabilize following a weak start to 2018.” The July MPR report estimates that housing will contribute a mere 0.1 percentage points to growth this year, with no contribution in 2019 and a slightly negative impact in 2020 (see Table below). The MPR elaborated that residential investment is slowing, reflecting the effects of higher interest rates and tighter mortgage rules. Resale activity contracted when the revised measures went into effect but is anticipated to improve over the next few quarters. Data on resale activity and housing starts suggest that the housing market is beginning to stabilize. The growth of new construction spending is expected to slow over the projection horizon. The new mortgage measures may cause households to purchase less-expensive residences because typical homebuyers are now more constrained in how much they can borrow. Meanwhile, exports are buoyed by strong global demand and higher commodity prices. “Business investment is growing in response to solid demand growth and capacity pressures, although trade tensions are weighing on investment in some sectors. 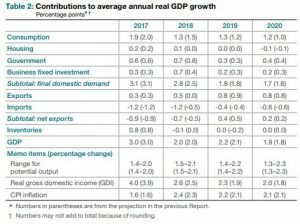 Overall, the Bank still expects average growth of close to 2% over 2018-2020.” This is somewhat above the Bank’s estimate of noninflationary growth at full capacity, the so-called ‘potential’ growth rate. Inflation remains near 2%, consistent with an economy close to capacity. The Bank estimates that underlying wage growth is running at about 2.3%, slower than would be expected at full employment. The actual growth rate in wages has recently been boosted by increases in the minimum wage rate in some provinces. Bottom Line: This rate hike signals that the Bank of Canada is determined to bring its benchmark overnight rate back to more normal levels and that the economy is strong enough to withstand further rate increases. The Bank believes that stronger-than-expected business investment, higher oil prices and a weaker Canadian dollar offset the adverse effect of greater trade uncertainty. Exports have surprised on the upside because of strong global demand. The mix of growth in Canada has shifted from housing and consumption to exports and business investment–the desired result of the many tightening moves introduced by the government, the central bank and the regulators to slow the rise in household debt. The Bank believes that this shift in the composition of growth will result in a more sustainable expansion. Markets expect the Bank to gradually hike the benchmark rate until it reaches 2% or 2-1/4% by the end of 2019–implying another 2 or 3 rate hikes by the end of next year. Governor Poloz said today at the press conference that the Bank’s assessment of the neutral rate for the benchmark is 2-1/2% to 3%, but it is uncertain how quickly we will get there. The Governing Council of the Bank is scheduled to meet again on September 5. The next full update of the Bank’s outlook for the economy and inflation, including risks to the projection, will be published in the MPR on October 24, 2018. As expected the Bank of Canada raised its overnight rate .25%, banks are expected to follow. More gradual increases to come – The next scheduled date for announcing the overnight rate target is September 5, 2018.- we expect an increase then as well. With the Bank of Canada holding rates steady this April, the same is not the case for the bond market, which impacts fixed rates. In every interest-rate market there are many factors leading to an increase and we are hoping to provide a little bit of clarity on what is happening and what it means to you and your loved ones. At this time, we see fixed rates increasing as the bond market increases, and our economists anticipate two more Bank of Canada increases of prime rate by the end of 2018. Why do we note this information and how does it relate to you? Review your lock-in options by contacting us or your lender directly. Knowing it’s unlikely the prime rate will reduce and fixed rates are on the rise, there could be a sweet spot to review your options now. If you decide not to lock in, it’s time to review your discount to see if a higher one can be obtained elsewhere. Locking in won’t be for everyone, especially if you are making higher payments and your mortgage is below $300,000, which most people fit and will continue on that path. Locking in will be around 1% higher rate than you are likely presently paying. If you obtained your mortgage in the last year, stay put. If you are looking to move up the property ladder or consolidate debt, get your application in to us ASAP so we can hold options for up to 120 days. If you are up for renewal this year or know someone who is, secure your options now with us to weight out the savings prior to renewal with us keeping a watchful eye on the market. Please reach out to us so we can help ensure you or a loved is on the right path in our ever changing market.